Ready to enter full out vacation mode, the Harringtons and the 'last Galma guest' loaded up the Matiz early on the morning of Wednesday, the 15th of August. The goal was to arrive in and enjoy a bit of Busan with a couple more days of Busan-enjoyment to follow. 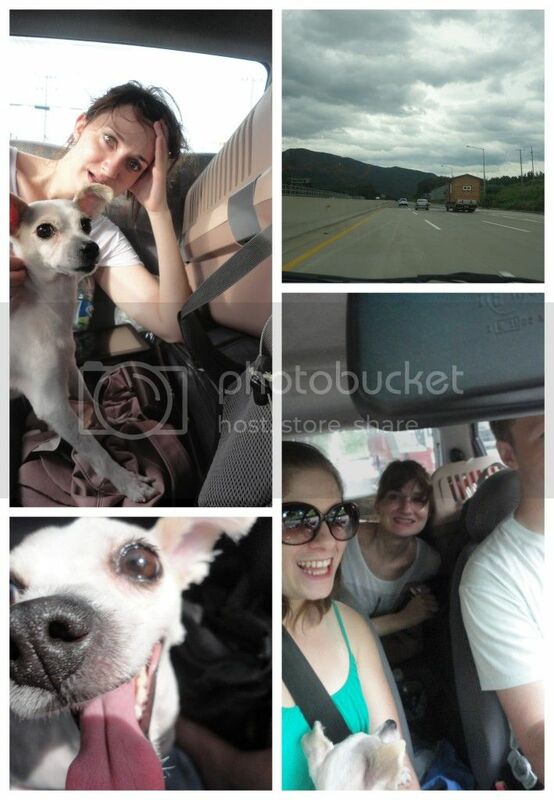 The Matiz was packed full with people, belongings and of course a sweet little 3-legged dog. After making the mandatory, Korea-rest-area Pit Stop, the man Harrington suggested stopping in Gyeongju where many dramas have been filmed/set and where the couple had previously road-tripped and enjoyed the sights immensely the winter before. 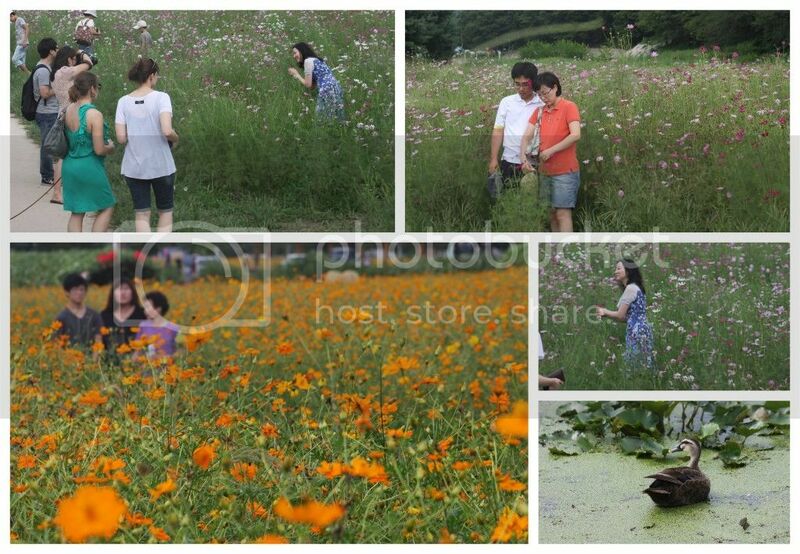 The warmth of spring and summer had worked their magic on the city of Gyeongju and all who occupied the Matiz were grateful for their decision to stop over. Fields of flowers and archways of gourds welcomed all tourists on this particular August afternoon. Bees buzzed, children laughed and families posed together to create lasting memories. Having braved the bee-ridden fields and snapped some of their own photo-memories, the crew re-loaded the Matiz and finished their journey toward the great seaside city of Busan. Upon arriving in Busan, the first order of business was to track down the hostel where Mandy planned to reside for a couple of nights. With expert navigation skills, Melissa used an old-fashioned paper map to lead the Matiz and her driver to the hostel where Mandy checked in and the group soon made their way to Gwangali Beach to seek out dinner options. Having decided to bring a three-legged animal along on this trip meant that many eating establishments were out of the running and it would be necessary to find an establishment with outdoor seating areas. Fortunately, Korea does outdoor seating well and coastal areas are always a good place to meet these requirements. 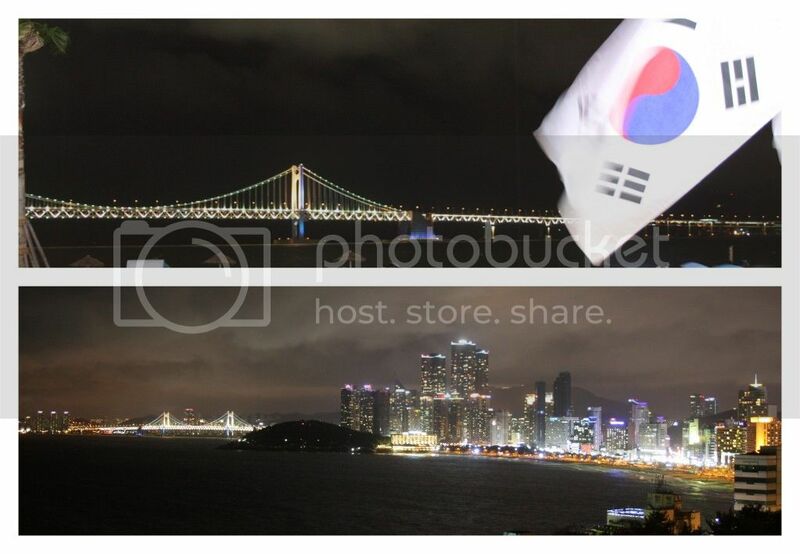 Unfortunately, there weren't always Korean food options, so the first night resulted in burgers and fries with a fantastic view of Busan's famous bridge and the ocean stretched out before us. With hunger abated and sleepiness setting in from the long day of sitting in a car, the couple dropped Mandy off at her hostel before heading out to Seongcheong beach. Parked and ready to set up their tent, the Harringtons soon found themselves fighting a large, borrowed tent for two hours as poles were mismatched and wrongly inserted and as the wind whipped and flipped the giant sheet of nylon in which the Harringtons hoped to sleep. Finally, tent staked down and poles correctly inserted the couple and their pup laid to rest not knowing that the night would be filled with crashing waves, intense lightening, crashing thunder and a scared pup. Morning would come all too soon, yet no matter the quality of sleep the Harringtons were grateful to wake up on a beach and on vacation.